A foodie is an affectionate term for anyone who enjoys food! Food lovers, food enthusiasts, food explorers and regular people – our tours are designed for everyone! What are Okanagan Foodie Tours? A new culinary experience is catching the attention of foodies at tourist destinations around the world. Enthusiasts are falling in love with these “Food Tours” as a unique way to meet people, experience the culture of a region, and enjoy fantastic meals from a destination’s hidden gems. We’re proud to bring that experience home to the Okanagan as Kelowna’s original food tour company. We offer participants a guided 3-hour walking and tasting tour packed full of amazing foods from local artisans, cultural commentary, and historical (and fun) facts. Why take an Okanagan Foodie Tour? Food tours are a memorable way to experience the Okanagan’s tantalizing foods, cultural commentary, and to learn fun facts along the way. Tour guides are foodies themselves and pay attention to every detail to ensure a fun and relaxing, yet satisfying and informative adventure for fellow foodies. Chance to meet, support and engage with local food artisans, chefs and restaurant owners. Indulge yourself with unique culinary insights and sample delicious foods – taste the “best of the best”. Great way to try new foods and learn about new restaurants that you can visit again for the full meal experience. TIP: If you’re visiting Kelowna, be sure to book your tour towards the beginning of your visit. That way you will have time to go back and enjoy the full menu of your favorite stops. 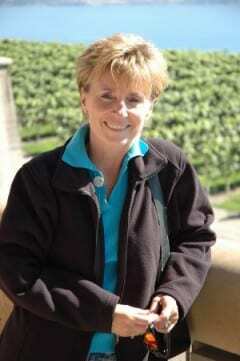 Hi, my name is Nancy Quinton – Owner and Tour Guide with Okanagan Foodie Tours. After a 25-year career managing the delivery of customer service excellence in the telecommunications industry, it was time to venture in a totally different direction. I had participated in food tours in Vancouver and Arizona and I was hooked! I wanted to bring this globally trending foodie experience home to Kelowna. My insight into the history of the area coupled with a genuine fondness for customer service was the natural genesis of Okanagan Foodie Tours. The beautiful scenery and perfect weather, paired with a vibrant culinary scene and great attention to the tourist industry provided a superb backdrop to introduce these unique tours to the valley. In preparation for the launch of Okanagan Foodie Tours there was a lot to learn. What I value the most is getting to know the great restaurateurs, chefs and their teams. What they present to their guests everyday is nothing short of scrumptious and I look forward to sharing it all with you. Let’s ‘take your taste buds for a walk’ with the Okanagan’s original food tour company. I’m confident the experience will be delicious, and of course filling, leaving you smiling and planning to come back for more!